Astronomers have found a pulsating, dead star beaming with the energy of about 10 million suns. This is the brightest pulsar – a dense stellar remnant left over from a supernova explosion – ever recorded. The discovery was made with NASA's Nuclear Spectroscopic Telescope Array, or NuSTAR. "You might think of this pulsar as the 'Mighty Mouse' of stellar remnants," said Fiona Harrison, the NuSTAR principal investigator at the California Institute of Technology in Pasadena, California. "It has all the power of a black hole, but with much less mass." The discovery appears in a new report in the Thursday Oct. 9 issue of the journal Nature. The surprising find is helping astronomers better understand mysterious sources of blinding X-rays, called ultraluminous X-ray sources (ULXs). Until now, all ULXs were thought to be black holes. The new data from NuSTAR show at least one ULX, about 12 million light-years away in the galaxy Messier 82 (M82), is actually a pulsar. "The pulsar appears to be eating the equivalent of a black hole diet," said Harrison. "This result will help us understand how black holes gorge and grow so quickly, which is an important event in the formation of galaxies and structures in the universe." ULXs are generally thought to be black holes feeding off companion stars -- a process called accretion. They also are suspected to be the long-sought after "medium-size" black holes – missing links between smaller, stellar-size black holes and the gargantuan ones that dominate the hearts of most galaxies. But research into the true nature of ULXs continues toward more definitive answers. NuSTAR did not initially set out to study the two ULXs in M82. Astronomers had been observing a recent supernova in the galaxy when they serendipitously noticed pulses of bright X-rays coming from the ULX known as M82 X-2. Black holes do not pulse, but pulsars do. Pulsars belong to a class of stars called neutron stars. Like black holes, neutron stars are the burnt-out cores of exploded stars, but puny in mass by comparison. Pulsars send out beams of radiation ranging from radio waves to ultra-high-energy gamma rays. As the star spins, these beams intercept Earth like lighthouse beacons, producing a pulsed signal. "We took it for granted that the powerful ULXs must be massive black holes," said lead study author Matteo Bachetti, of the University of Toulouse in France. "When we first saw the pulsations in the data, we thought they must be from another source." NASA's Chandra X-ray Observatory and Swift satellite also have monitored M82 to study the same supernova, and confirmed the intense X-rays of M82 X-2 were coming from a pulsar. "Having a diverse array of telescopes in space means that they can help each other out," said Paul Hertz, director of NASA's astrophysics division in Washington. "When one telescope makes a discovery, others with complementary capabilities can be called in to investigate it at different wavelengths." The key to NuSTAR's discovery was its sensitivity to high-energy X-rays, as well as its ability to precisely measure the timing of the signals, which allowed astronomers to measure a pulse rate of 1.37 seconds. They also measured its energy output at the equivalent of 10 million suns, or 10 times more than that observed from other X-ray pulsars. This is a big punch for something about the mass of our sun and the size of Pasadena. How is this puny, dead star radiating so fiercely? Astronomers are not sure, but they say it is likely due to a lavish feast of the cosmic kind. As is the case with black holes, the gravity of a neutron star can pull matter off companion stars. As the matter is dragged onto the neutron star, it heats up and glows with X-rays. If the pulsar is indeed feeding off surrounding matter, it is doing so at such an extreme rate to have theorists scratching their heads. Astronomers are planning follow-up observations with NASA's NuSTAR, Swift and Chandra spacecraft to find an explanation for the pulsar’s bizarre behavior. The NuSTAR team also will look at more ULXs, meaning they could turn up more pulsars. At this point, it is not clear whether M82 X-2 is an oddball or if more ULXs beat with the pulse of dead stars. NuSTAR, a relatively small telescope, has thrown a big loop into the mystery of black holes. 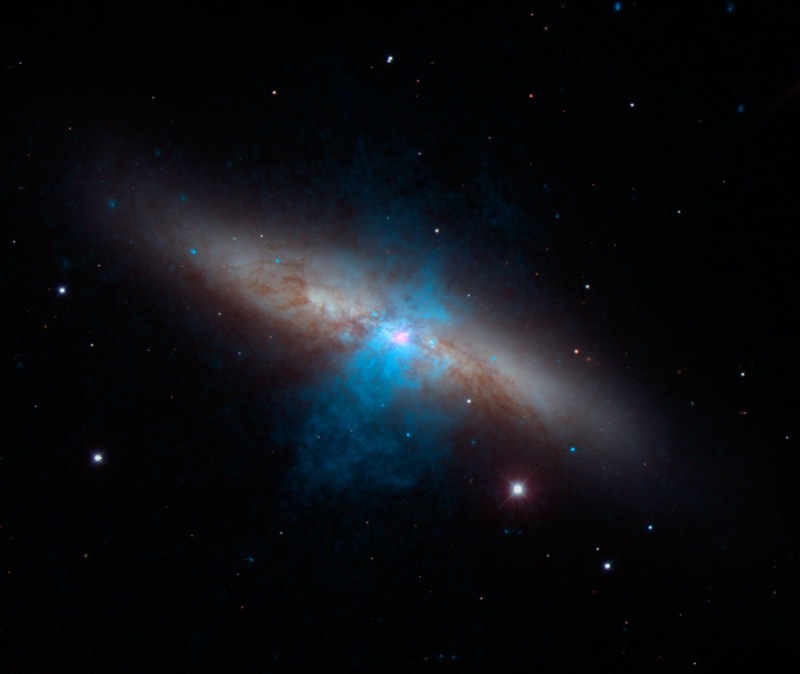 “In the news recently, we have seen that another source of unusually bright X-rays in the M82 galaxy seems to be a medium-sized black hole," said astronomer Jeanette Gladstone of the University of Alberta, Canada, who is not affiliated with the study. "Now, we find that the second source of bright X-rays in M82 isn’t a black hole at all. This is going to challenge theorists and pave the way for a new understanding of the diversity of these fascinating objects."